I always felt short-changed on grandparents. Only one, my mother’s father, survived into my lifetime, and he died when I was eleven, after a hushed-up car accident when he drove his car off a road into a wall - probably as a result of by his failing sight. Grandparents were something other people had or spoke about, but to me they were a shadowy relic of some dim and distant past existence. And it wasnt helped by the fact that, on my father’s side particularly, they had themselves been old parents. My paternal grandparents were born in the 1860’s, almost a hundred years before I was born. A hundred years ! Could these people have any connection with me? As children do, I heard the odd passing reference to these far-off ghosts, but they werent real to me, they didn’t inhabit a world that was anything to do with my world. “ She was a fine woman”, my mother would occasionally say of her long since dead mother-in-law. But this conveyed only ambivalence to me, even as a child. Was she saying this out of reverence, some sort of pious memory, or was there a sub-text of resentment in that, as it seemed to me, rather guarded compliment? It was impossible to know, and in any case, to me as a small boy, it really didnt matter too much. But the tone in which this information was delivered was remembered, filed away, to be recalled later as something significant in unravelling family dynamics. Janet Macpherson, ( or Jessie ) as she was before she became Mrs Welsh, only slowly entered my consciousness. I gradually became aware of her presence in the photograph album, as “your father’s mother”, and even though that had no flesh-and-blood significance for me, she began to exist dimly in my awareness. In all the photographs she seemed very old. A small, bird-like creature, rarely seen smiling, often standing protectively next to my father, her face had a care-worn, tired look about it it, as though life had indeed exacted its toll. I only remember thinking she looked sad, but as I knew nothing of her life, I never ventured further into wondering what she or her life was really like. Children and grandchildren have no obligation after all to suffer for the struggles of their ancestors. With time, however, my curiosity began to be unsatisfied. As the generation of my own parents began to disappear, the questions that had remained unanswered became more urgent - the links in the chain were gradually becoming fewer and fewer. We were a very small family and my father, living himself till the great age of 97, was the last in a line. He himself had rarely talked about his background and now there was no-one else left to remember it. His own memories of his mother, as he neared the end of his life, were always tearful. Again, what he conveyed to me was sadness about her life, her sacrifices for him, her struggles. So in that respect my childhood interpretation of the photographs had been right. They could tell me more now that I was old enough to read the clues. After a death in the family, there is the great ritual of the “sorting-out-of-things”. Depending how you look on it, I had been fortunate or unfortunate enough to have had this task fall to me three times in the last five years. And in the case of my mother, father, and uncle, all of whom lived into their eighties and nineties, I find myself making journeys back in time through the artifacts of long lived lives. I looked again at those photographs and began to want to know more of what these people were like, perhaps to try to replenish the grand-parental love which I missed out on, and the lacuna of which, as time goes by, I am more and more acutely aware. I didnt have these grandparents, didnt know them, but I want something of them to speak to me, even if it is only one-sidedly entering into their lives from the perspective of the detective assembling the pieces of a jigsaw. So picking up the clues from the bits and pieces of insignificant personal effects,a letter, a book dedication, a ring, a half sovereign given to my father by his mother, and those photos, becomes a search for the essence of someone from the ether of lost memories. Quite unconsciously I had done something similar with my other grandmother some years before. Like Mrs Welsh, Mrs Meston, my mother’s mother, had died before I was born. The story of her life had similar undertones of sadness. One of eight children of an Aberdeenshire farmer from the village of Echt, all of her seven siblings had emigrated to America in the first years of this century, leaving her behind as a dutiful wife to a straight-laced God-fearing Prestbyterian husband. Her inconsolable grief at the loss of her brothers and sisters was supressed into a life-long silent lament at the loss of love and warmth, in favour of duty and service. This I was never told, but somehow I knew it before I had seen the evidence of it myself. Again, even as a child, just from seeing the photographs, I felt the need to extend my hand and heart to console this woman, inside whom there was such a painful heart. Her look of stoic resignation spoke volumes. With an on-the-face-of-it happy family of husband and two children round her, how could she give way to her inner grief? But the camera was witness to her grief. And I felt she knew that too, in the way that she denied nothing in front of it. If she had no close soulmate to open her heart to, she let the camera be a silent confidante. She wrote many letters to her American siblings, some of which have returned to my safe-keeping. But the tenuous thread of my connection with her is woven into a much stronger bond by my discovery some years ago, at the bottom of my mother’s writing desk, of her fountain pen. The pen had been forgotten, slipping into oblivion with the other detritus of a forgotten life. From the moment I picked it up, I felt the years seamlessly slip away, as though she had only just signed a letter to me with it. If only I could have written back to her! I wanted to tell her of my existence, of how I cared for her, recognised her pain and wanted to bring some light into her weary days, and that her suffering was not forgotten. A feeling of quiet communion with her returns to me every time I use it, which I do often. I never found another pen that fits into my hand so well, like a well worn pair of shoes does onto the feet. The nib too is worn away on one side. There is still a frisson in imagining her writing with this old, rather stubby Parker pen, still with its original ( and how-on-earth-not-perished ) inner rubber ink-sack. Through it she talks to me, I to her. One day I shall use it to write her story. But about Mrs Welsh I knew much less. My father’s family, unlike my mother’s, were not great hoarders of things, so gleaning information was much like looking again and again in an empty cupboard and hoping that something else might just miraculously appear on a shelf. By the time of my father’s death I knew all that could be passed to me by word of mouth, from what he could remember. There were no letters from her, no written evidence of her life. But such information as my father had given me was corroborated by various documents. 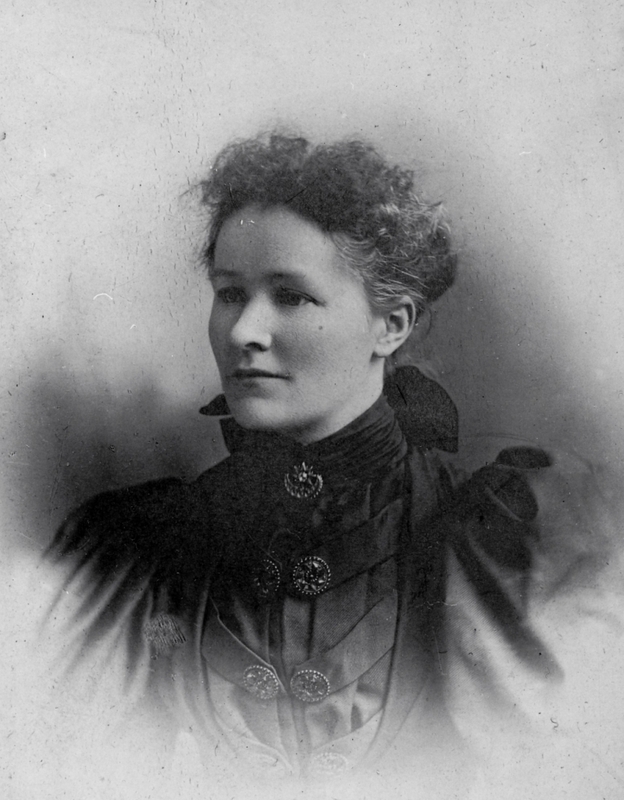 Janet Macpherson was born in December 1861 at Insh, near Kingussie. From the one photograph of her parents, taken by a professional Grantown photographer, one can tell that they were poor. Those were the days when having a photograph taken called for the donning of the best clothes in the house, and indeed one can see that they had made an effort. But the effort can’t conceal the fact that the father’s ill-fitting baggy trousers are of a course woollen sort, or that the mother’s rather shapeless long hooped black skirt ( reminiscent of the images of Qeen Victoria’s mourning attire ) is of the plainest variety. The faces are unsmiling, only a record of existence, frozen stares which give and take nothing. But then this must have been early days of photography when the held pose was all important. Curiously the mother is holding in her hand a photograph. Perhaps the occasion was recording a death in the family. It could have been her sister, who died as a young adult. Why else would you be photographed holding a picture of someone? According to Janet’s marriage certificate (which refers to her as Jessie), her father was a shoemaker, and with six children to support, cobbling all day and all night may have been the only option for him. She was thirty six when she married Thomas Welsh. The marriage took place in 1899 in Edinburgh, in Robinson’s Temperance Hotel, and the certificate duly records that Jessie Welsh was a Domestic Servant, and Spinster. The latter description actually responds to the question “whether Single or widowed”, and was of course in the custom of the day the correct description of her status. Maybe in those days the word spinster didnt carry the pejorative connotations with which we associate it now, but given her age, with a slip of the pen the registrar might just as well have written “old maid”. Certainly by the time she was photographed with my seven or eight-year-old father, she looked more like his grandmother than mother. But what of her life between the time of her youth in the Highlands and her marriage? Some twenty years were to pass between the time she probably left school, and her wedding. Growing up at Milehouse, closer to Feshiebridge than Insh, the six children must have been thrown back on their own devices for their entertainment. But what they lacked in material things was richly compensated by the beauty of their surroundings. They only had to run across the road into the birch wood opposite the house to be lost in a magical world. The thick carpet of mosses and lichens even to this day invites you into a special secret place where every tiny sound is heard as though it speaks to you alone. Arthur Rackham’s elves would have been at home here, or J.M.Barrie’s lost boys. Running in the opposite direction, from the back door of the cottage down to the stillness of the loch, the great beech trees arching above create mighty cathedrals with a carpet of coppery leaves underfoot. In the days before she left home, Jessie would have learnt from her mother simple tasks such as sowing , enabling her to skillfully mend the clothes that could still offer a faint hope of some sort of resurrection, in preference to squandering money on fripperies or flibbertigibbet things. She may well have walked the long road to attend the Girls’ Sowing School in Insh village. She would go about the house helping her mother with the running of the home, the boiling of clothes on washday, adding the launderer’s blue, putting them through the mangle, starching the collars. Scrubbing the range, filling the coal bucket, polishing the brass door knobs - all these tasks were part of the daily routine, and were to be even more part of her life ahead. Was life secure and happy? How can we tell. Memories of the clearances must have haunted all the simple folk, and not to be dependent on the land for a living may have been more an expedient than a choice. You only have to look in the graveyards such as at Laggan Bridge to see how many tacksmen - agents for the landowners - lived in the area. Jessie would have known early on in life that there was little choice for her but to find employment in some form of domestic service. So for her to go “into Service” was talked of as both a vocation and perhaps already a way of ascending a social ladder, albeit a small step. She would have been taught the virtues of decency, frugality, of not answering back to those of higher social standing, and above all of not having airs and graces above her social standing. In other words she was inculcated with the values of an old feudal system. That life was not without its grim shadows. One day her mother’s sister, who was in service at Scourie Lodge in the far north west, had collapsed and died on Kingussie Station at the start of her long journey back to her work. God knows what trauma, physical or emotional she may have been suffering. But did the reality of this life leave any room for a young girl’s aspirations, hopes and, God help her, desires? In the grand draughty remote highland homes in which she began to find employment, she would find herself a prisoner of duty, and of this God called “Service”. The Scottish aristocracy maintained their hunting lodges with a gillie and a housekeeper, but for much of the year the dark panelled rooms of these houses remained cold, and echoed to the footfalls of their cartetakers. It was usual for these positions to be occupied by a couple who would thus provide their own mutual company, but often there would be an extra housemaid who would live in. Jessie would have taken on her duties with an eager willingness, born of her wish to be a credit to her God-fearing parents and to the ideals that they had brought her up to respect. It would have meant a lot to her to prove her worth, for her father, though the precentor at Insh church, was known to have a weakness for drink. What was more shaming was that it was rumoured that he and the minister shared the habit. This curse of drink lingered long in the annals of the family, and the only son, Jessie’s brother Willie, carried this “weakness” into the next generation. But a secure wage and position as a valued holusemaid in a remote lodge brought with it a price. For a girl of marriagable age, it offered little or no prospect of meeting a prospective husband outside the closed circle of the staff of the house. With no transport, no telephone, no means of communicating except by letter, Jessie would have found herself gradually settling into a gilded cage, though the creature comforts it offered would hardly have been luxurious. One striking photograph of her exists from this time in her life. It is a formal pose. She is wearing an elegant black dress with huge puffed-up sleeves, and a central panel which has some diagonal bands of material which meet in a v shape in the middle. Two vertical rows of large metal-work buttons meet at the top where a single button adorns a high halter neck . Her hair is tied back with a large silk bow. The dress looks almost too grand for her - could she have borrowed it for the photograph? Without being pretty there is a dignity and poise about her - the sort of face that used to be described as “handsome” - which suggests an inner resolve. It looks to me very much like the sort of photograph that she might have sent to potential employers, seeking work in an experienced role in a household. Certainly the elegance of the clothes suggests that Jessie might have had her eye on the position of a governess, but she never fulfilled this ambition. Later photographs bring out much more vulnerability. I imagine that by her mid-thirties, by which time her mother was dead, desperation about her situation must have been growing to breaking point. Not being able to face another lonely winter of isolation, It was then that she plotted her escape. Making an “ arrangement “ with one of the carriers who supplied the lodge where she worked north of Dornoch in Sutherland, she packed her meagre belongings and made a bid for freedom. Her guilty decision must have caused her many sleepless nights, and she would have known that it would make it far more difficult, if not impossible, to procure subsequent employment. But something momentous must have propelled her from the quiet security of her Highland life into seeking employment as far away as Edinburgh. Leaving behind her elderly father must also have caused her some anxiety, (though the knowledge that a married sister lived near the father may have made her passage easier.) At that point in her life, it would have been the obvious and expected thing for an unmarried daughter to take on the task of looking after her widowed father, especially as her own prospects for marriage were by that time diminished. But to embark on a new life as a single woman in a city about which she knew nothing at the age of thirty five? One can see this slight figure, neither any longer a girl nor a woman with any social standing, tearfully bidding farewell to her sisters as she boarded the train in Kingussie. Sitting forlornly under her best and only bonnet on the slowly puffing train, as it made its awesome journey through Glen Garry, past Loch Tummel, Pitlochry, Perth and finally cossing the grand new Forth Bridge, just finished in 1890, she must have wondered just what the future would have in store for her in the formal grey streets of late Victorian Edinburgh. But armed with glowing references and a simple faith, there must have been hope too. She never recorded her feelings about this period of her life, ar any period for that matter, but the hoped-for miracle happened - she met and married my grandfather Thomas Welsh. Thomas was also “in Service” as a gardener and Domestic Servant, and also, at the younger age of 33, late to marry. How lucky that they found each other, of similar ages and backgrounds, in the new Jerusalem of Jessie’s life in Edinburgh. Perhaps the couple saw their future opening up together as the live-in Butler and Housekeeper of some grand house in the Georgian New Town. But shortly after their marriage the couple moved to Peebles, ostensibly to be nearer other members of Thomas’ family who had lived in the area for several generations. It is unlikely that the move was made for reasons of work, which would have been much more plentiful in a city like Edinburgh. More likely was that it was made as a result of a dark cloud hanging over the newlyweds, and it may even have been that Jessie married Thomas knowing that he was not a well man. In 1904 Jessie, now aged forty three, gave birth to twins, which must have been a joyous event for her, but my father’s twin died just after the birth. And Jessie’s troubles were only just beginning, for the birth coincided with Thomas being diagnosed with the cancer that was to kill him three years later. My own father never remembered Thomas, so the likliehood is that he was in and out of hospital during those years, already a ghost before his death. He was only a ghost in my father’s memory. 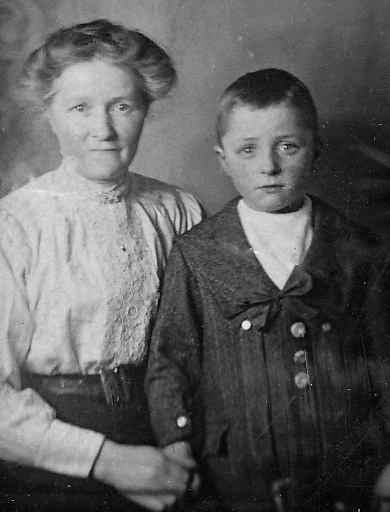 As the boy grew, Jessie struggled to keep him and herself by working in a local woollen mill at nights. She worked as a burler, which is to say that she took the knots out of the wool before spinning. Without any of her own family near her, and without any education to speak of herself, hardship was her constant companion, but her dedication to providing what she could for the education of her son was total. None of this would have been remarkable for it was only in keeping with her philosophy of selfless giving, and her son was everything she had sacrificed her old life for. Time passed and my father found his place in life - a self-made man, of whom his mother must have been inordinately proud. But such was the bond between them that he himself found his own wiving held back by the binding ties of loyalty to the by-now diminutive Jessie. He could never forget the struggles that she had endured to give him a chance in life. Finally he married my mother in 1940 five months after Jessie died at the age of 78. I opened the small black book with a not-knowing quiver of anticipation. It was only one small thing out of a pile of never-ending letters, photographs and things, things, things. What to do with these shackles of previous lives? To close one’s eyes and unceremoniously bundle the whole lot off to the tip? To say “it’s not my life”, and that these things are only pulling me back to an existence that is now irrelevant, is an option. Why try to understand the haphazard progress through events and feelings of other lives which have long since ceased to have corporeality? Yet something draws me with an unstoppable curiosity. The little hard-back book has the word Memo printed on its cover. And inside, in a methodical childish script, the words “Cooking Hints”. At first I dont recognise the writing, but then I remember some years back my mother referring to “old Mrs Welsh’s Recipe book”, as though it might have been a precious family bible, or at the least some alchemical manuscript enshrining some precious secrets. In moving from one house to another it had joined the list of many things irretrievably lost. Uereka! Here it was. As I leaf through its pages I begin to sense that here in fact is something more tangible, more real than all the social history books could tell me of the times and of two women’s devotion. 1/2lb. Neck Mutton, 1 Small Bone, 1 Small piece of carrot, turnip and onion. 2 tablespoonfuls of barley. 1 Tin of Cream of Tomato Soup. Make stock with meat & bone. Leave till cold then remove grease. Simmer the vegetables and barley for about 2hours. Strain stock and add Cream of Tomato. Add salt and sugar if preferred. A little cream or milk may be added. There are things that this simple recipe tells me. To use A tin of Tomato soup by itself would have seemed to Jessie much too easy an option, and inadequate as a source of nourishment for the growing boy, so by adding a few more nutritious ingredients it could be made more wholesome. But then one small piece of carrot, turnip and onion begins to suggest parsimony, and the simmering of those ingredients for two hours to recall the old method of cooking everything till it was totally devoid of any colour or texture. The addition of salt and sugar “if preferred”, and of “a little cream” suggests that this was a recipe that Jessie may have remembered from a cook in a grand house, but not neccessarily what she herself would do, given either the choice or the means. A subsequent recipe for Lentil Soup similarly urges “remove grease”. Fat described as grease somewhat removes the romance of cooking, but after all food was a means to sustain life rather than an epicurean pleasure. This recipe also suggests adding “a very small knob of butter”. Rice Soup includes 2 leaks, spelt like the dripping of water rather than the vegetable, betraying Jessie’s basic education or lack of it. For chicken stock the carcase rather than the more modern spelling of carcass is used, and Hough Soup (pronounced Hock) requires the boiling of the bone for three hours. Time and again a small piece of onion, carrot, barley , fish, suet or meat is required. For mince the addition of dough balls is suggested with the warning,- “make balls very small as they swell.” Everywhere is economy writ large. Following on, the next section of the book is devoted to Stews and here not only does the writing begin to be looser, but the list of ingredients begins to be more adventurous, including beaten white of egg, lemon juice, lean steak, and a few haricot beans. The concision concerning the ingredients of the earlier recipes gives way to “any cold boiled meat does for this” in a recipe for Rissoles. But in spite of this the picture is austere. Apart from one reference to pepper, there is rarely any mention of seasoning. The meats are repeatedly required to be boiled for hours. 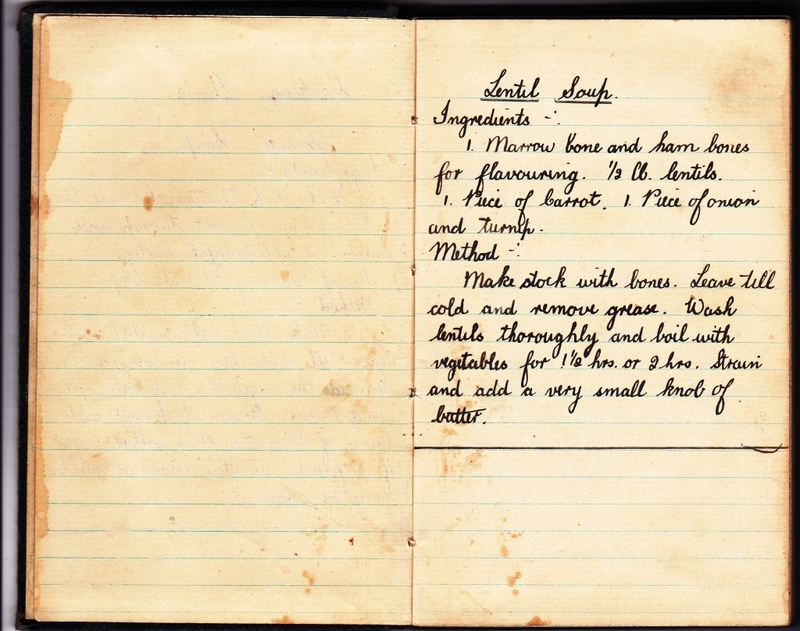 Then suddenly without so much as missing a beat, the handwriting changes and on the next page the recipe is for Date and Raisin Loaf. In one smooth seamless gesture my grandmother had handed over not only her treasured son, but also, like a dowry, her recipe book, into the safe keeping of my mother, whose duty as the new protectress in his life was to carry on with the gospel of this holy book, a secret treatise on the art of loving. The two Mrs Welshs were, as it turned out, the only women in my father’s long life, and towards the end of his life he used to get muddled as to which had been which. These two guardian angels gave him life, love and nurture. There were other ways in which the little book reflected these women. My mother’s preference in cooking was in the making of cakes, puddings, jams and other sweet dishes, so as the recipes in the book moved chronologically from the beginning of a meal to the end, her part of the book naturally followed on my Grandmother’s savoury dishes. Between them they covered the whole spectrum of cookery. But austerity would still be reflected in recipes such as “War Time Gingerbread” using oatmeal to eke out the flour, and saccharin in place of sugar, “Eggless and Sugarless Chocolate Cake” , “Carrot Marmalade”, and a 1944 Ministry of Food recipe for Christmas cake, calling for 6 “made up dried eggs”. With rationing still in place in the late 1940’s for dried fruit, margarine and sugar, evaporated milk replaces sugar in many recipes, and in the 1950’s “Hasty Pudding” would be every young mother’s answer to the demands of a growing family and her own work. I can remember too from my very early childhood the eggs preserved in water-glass standing in a bucket in the larder. Tucked in at the back are recipes taken from newspapers and magazines from the 1950’s including such mouth-watering delicacies as Peach Lemon Jam ( though still using dried fruit), and the book comes to an end with a last entry from August 1956 for Grapefruit Marmalade, sugar and all, no holds barred. As the family’s prosperity had increased, so too had the scope and variety of the recipes. In the unspoken language of the old ways, the women knew how to keep their menfolk close to home and heart. If old Mrs Welsh had finally lost the centre of her universe, she could rest at peace with the knowledge that she had given him with the talisman that could sustain him ( literally) in the next phase of his life. The sum of her simple knowledge was enshrined in that small volume. That the recipe book was a common bond between the two women now seems to me a touching sign of their shared though separate devotion. 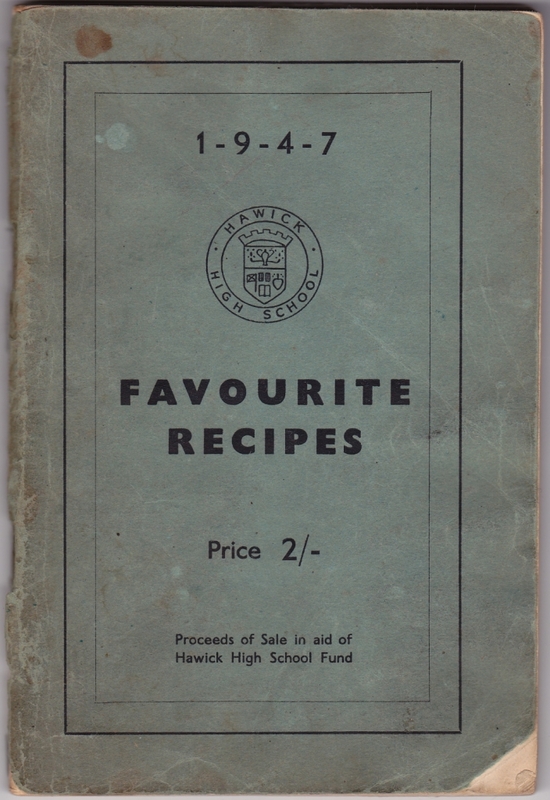 Having filled up the remaining pages of the recipe book, I suspect my mother must have felt at last a sense of being freed from the domestic influence of her mother-in-law, having done her duty by the treasured son. I suspect there were also times when she resented the hold that the dowager Mrs Welsh held over her son, which may have contributed to my mother and father’s protracted engagement. For Jessie the best years of her life were probably the last decade, when she knew some security as a result of my father providing both home and money for her. She was able to visit her relatives again in the highlands, and relished the warm atmosphere of family life that she had missed being on her own in the borders. A cousin remembered that, on one occasion, as she was put on a train for the return journey south a place was found in a carriage opposite an old, completely bald gentleman. “ No, no, Alick”, said she,” I dont want to spend the journey looking at that old skating rink.” So livelier company was found. As the years rolled by the little book was forgotten and replaced by more streamlined versions entirely in the hand of the new Mrs Welsh. One other entry stands out. It is a recipe for Pancakes ( “dropped scones” in England), and it is written in my father’s script. For some reason or other pancakes were one thing my mother was not keen on making, and one thing my father really loved. His handwriting is urgent, demanding, somehow petulant. Ironically this recipe had come from a woman who in later years was to usurp my mother in a maternal role to my brother. It must have pained my mother to see this attribution in my father’s hand in the midst of her own recipes. As far as pancakes were concerned the two Mrs Welshs had failed him, and in frustration he had pushed his way into their secret domain. But there was a price to pay: his tactic didnt work. After that if he ever wanted pancakes he had to make them himself. As I close the pages of the book, and return it to its pile, I feel I know my grandmother a little better. Her recipe book adds another chapter to her unwritten autobiography. It tells her story in understatement, revealing far more about her life than she might ever have imagined. And I’m sure if I ever try her recipe for lentil soup, I’ll hear her voice reminding me to add just a very small knob of butter.